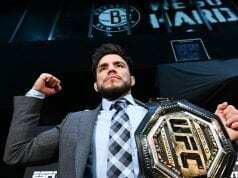 While the co-main event will go along way in helping clear up the 145-pound division, the main event should yield a new No. 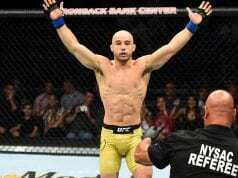 1 contender to the bantamweight strap as Raphael Assuncao and Marlon Moraes will meet again. At 36 years old, Assuncao is riding a four-fight winning streak. He most recently defeated Rob Font at UFC 226 last July. He will look to make it 2-0 vs his Brazilian counterpart. Moraes has gone 3-1 since signing with the UFC. His only loss in that stretch was his promotional debut to Assuncao. Moraes gets a rare opportunity to get one back in MMA. Moraes takes center he throws a hard leg kick. Assuncao throws one of his own. Assuncao throws a jab followed by a leg kick. Moraes slips and throws a leg kick. Moraes circles right as Assuncao follows. Marlon throws another leg kick, possibly setting up a later high kick. Moraes connects with a sweeping right hand. Assuncao is hurt. Moraes closes the distance and lands another punch as the fight goes to the ground. Moraes is in Assuncao’s half guard and landing some big punches. Moraes looks for the guillotine choke and goes all out for it rolling to the back. He gets Assuncao to tap.